a room full of highly engaged and motivated entrepreneurs, Nely Galan, former Telemundo President and media powerhouse, proclaimed, "Latinas are starting more businesses at a faster rate than they are getting married!" This was one of the most resonating phrases of the Coca-Cola Adelante Tour which took place this past Saturday in Santa Monica, California. The first stop in a national tour, Coca-Cola in conjunction with Galan and Count Me in for Women's Economic Independence, Saturday served as the catalyst for a movement targeting Latina women who are thinking of starting or are currently ready to grow their own business. Key speakers included Galan, the award-winning author Sandra Cisneros, and Nell Merlino founder of Count Me In and the originator of Take Our Daughters to Work Day. With stories highlighting not just the success but the struggles and sometimes failures, these women connected with and encouraged the Latina audience to persevere. Or as Sandra Cisneros put it, to transform the darkness into light. They all drove home the point that motivation and dedication are just the beginning. Preparation in the forms of business skills, a support network and financing can be the difference to propel a Latina owned business to become a multimillion dollar business. Merlino especially focused on being more proactive: creating a network, sharing the business plan, and going after customers. The Latina audience covered the gamut in ages, nationalities and industries but the one thing that connected all of them was the palpable desire to succeed and the eagerness in receiving advice from women already in leadership positions. At the end of the day, after finding commonalties and establishing a sense of shared purpose a community had been formed. This community is now charged with the mission to spread the message Coca-Cola, Nely Galan and Nell Merlino have worked hard to establish: help each other become the entrepreneurs that will change the face of business. As a witness to this amazing event, I believe its only a matter of time before that occurs. 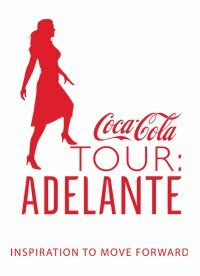 For more information about the Coca-Cola: Adelante Tour please visit their Facebook page.